June is an exciting Month around here. As a demonstrator, I've been exposed to new stuff coming out in July while at the same time, it's my LAST CHANCE to say goodbye to some of my favorite sets. That part is sad, but my favorite website for ideas, sharing tips, and connecting with demonstrators Stampin' Addicts is hosting a Retiring Sets Mega Hop. 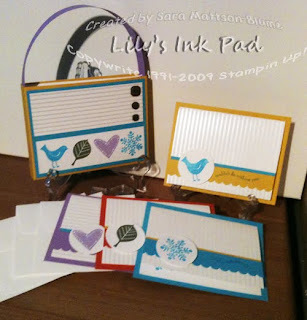 Yes, it's a MEGA hop, which means you can visit over 25 blogs by Stampin' Up! demonstrators featuring each person's dearest set which will not be available after June 30th. You may already have come from Adrianna's blog featuring that cute owly set: "Owl Together Now," or perhaps you are starting here. Hang on you are in for a ride! My purse was made by scoring a 8" x 10" piece of cardstock at 1" from the long edges and 4 1/2 and 5 1/2 from the short edges. Easy and cute! 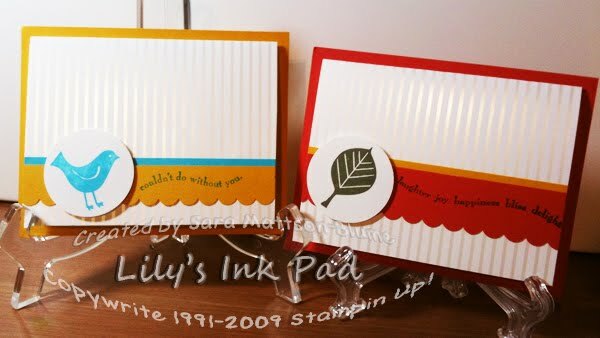 That's all I have, so enjoy the blog hop by visiting Heather's blog featuring Enjoy Every Moment, a great stamp set! If you get lost along way, just go to Stampin Addicts to catch back up! Super cute set Sara! Nice work! Isn't this a very versatile set? Perfect starter set! Great job on the ensemble! I love that pack of seasonal note cards! What a great idea! Love this set, and the way you used the Bride DSP to set it off! Cute project! Thanks for the instructions. Awesome, clean and simple cards. Thanks for sharing your talent with us. splendid job you did..WTG.. thanks for the opportunity.. Very cute! Perfect for a class or a gift! What a great gift set...awesome for teacher gifts, too!! Super use of this set. Really cute set Sara! I love that set just for the versatility of it! Sara, I love that set! You can really do so much with it. The purse is just perfect! great work-i love the little purse! Great idea for a small set like this! Very cute. Hi Sara, what a great set of cards and box to put them in. Nice work as usual. Hope everything is going great your way.